Police are concerned about 19-year-old Jade McGrath who has been missing since Wednesday. The search for a vulnerable teenage girl who is missing from home has continued this weekend. 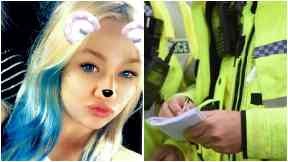 Jade McGrath was last seen on Wednesday, November 2018 in the Leachkin area of Inverness. Police Scotland have issued a fresh appeal for information, saying they would like to ensure the 19-year-old's safety 'as soon as possible'. Anyone who may have seen her is asked to come forward. Officers are especially keen to hear from any drivers with dash-cam footage from 1:30pm on Wednesday November 28, who travelled on Leachkin Road, General Booth Road or King Brude Road. Jade, who has links to the Aviemore area, is described as around 5ft 1in with a slim build, platinum blonde hair and blue eyes. When she was last seen she was wearing a light grey turtle neck top, parka jacket, black leggings and fawn coloured boots.